New Ports: Coney Islands of the Seas? Now that ships have become destinations in their own right, the 225,282-ton Oasis of the Seas has had to set up some of its own ports of call as it's too big to go to most other places. A new dock has been built at Labadee and a new port is being developed for her at Falmouth, Jamaica. Recent new ports developed by the cruise lines have also included Cozumel (Cruise Examiner, October 5) and Costa Maya in Mexico, Roatan in Honduras and Grand Turk in the Turks and Caicos Islands. These places, with their instant shopping villages, restaurant outlets and beer halls, tend to style themselves after the North American suburban mall, except for the more recent addition of theme park rides, which is bringing them more into line with theme parks. So this week, let's have a look at the places the mass market lines go and examine some recent trends brought about with the advent of the jumbo cruise ship. 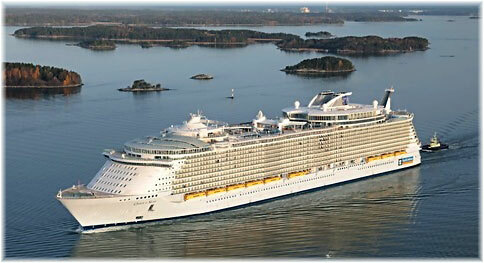 For years there were two ports in the Eastern Caribbean that most cruise ships sailing from Florida went to. 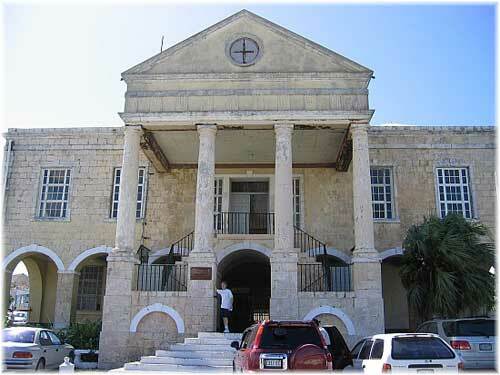 One was San Juan, in the associated free state of Puerto Rico, and the other was St Thomas in the US Virgin Islands. Indeed, St Thomas became so large that malls were finally built right on the docks so that passengers could shop without having to go into the town of Charlotte Amalie. And of course Americans could double their duty-free purchases from the usual two bottles of spirits to four at St Thomas. However, is beginning to be the mass market cruise of the past. Starting next month, the Oasis of the Seas will run a 7-day Eastern Caribbean itinerary from Fort Lauderdale that will include St Thomas, St Maarten and Nassau, and a Western Caribbean itinerary to Labadee, Costa Maya and Cozumel. 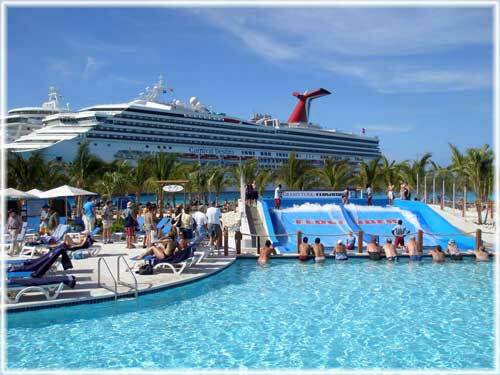 In December 2010, the new Jamaican port of Falmouth, whose opening has been delayed a year, will replace Costa Maya. If Falmouth is anything like Cozumel and Grand Turk it will have shoreside beer bars and "retail experiences" galore, but there may yet be hope. Meanwhile, NCL's new Norwegian Epic will sail from Miami to the same Eastern Caribbean ports as the Oasis of the Seas but her Western Caribbean itinerary will include Costa Maya, Roatan and Cozumel. Although two calls in Mexico may be rather repetitive, at least the Oasis of the Seas will be able to switch to Jamaica ina year's time. As of today, we have landside surfing at Grand Turk, which now has a FlowRider installation dockside that is similar to those carried on the larger Royal Caribbean ships. Opened in June 2008, this is now part of the new $50 million Grand Turk Cruise Center, which features an 14-acre shopping and restaurant complex and dates to February 2006. Among other things, it also includes the Caribbean's largest Margaritaville bar, restaurant and store, and 45,000 sq ft shopping centre. Previously an isolated out-of-the-way island of 3,700 souls that had not seen regular passenger service since the Clyde Line a hundred years ago, Grand Turk has now come to the fore as a Carnival Corp & PLC cruise port that is relatively close to Miami, and only thirty miles south of the Bahamas. Indeed, it is mainly Carnival, Costa, Holland America, P&O, Princess and Seabourn ships that call here except for the odd unexpected call by Crystal, Oceania and Regent Seven Seas. Elsewhere, next week, a new elevated chairlift will begin taking cruisers from the Carnival cruise terminal at Roatan directly to the private beach at Mahogany Bay. Passengers will pay $5 for a pass for unlimited six-minute rides that travel 67 feet above the ground and the treetops. With a capacity of 1,500 passengers an hour, the four-passenger chairlift units, named by Carnival the "Magical Flying Beach Chair," look very much like a conventional ski lift. Last year, the three-acre Roatan Cruise Port Village was opened there by Royal Caribbean, something that added shopping to the agenda where previously they had had to rely on that island's "rustic charms.". Royal Caribbean has gone a step further at Labadee, however, with the opening this year of a new "Dragon's Tail" Alpine roller coaster at its private "island" beach in Haiti. According to Adam Goldstein, Royal Caribbean International president, riders will reach 680 feet and "have just enough time to catch your breath and marvel at the view before turning and whooshing down at 30 miles per hour. Racing through 360-degree turns and dips, waves and curves, riders will be able to catch glimpses of the ocean." The ride time will be 3-5 minutes, of which about two thirds is reported to be up and about 30 seconds down. Royal Caribbean charge $35 per passenger for the ride (a child with an adult rides free), and $85 for the "Dragon's Breath Flight Line" zip-line. There have been a number of protests that Royal Caribbean is charging too much for these installations, where they have everyone captive anyway as it is a private island (it's actually a peninsula). Once back on board, however, passengers can benefit from the carousel and zip-line on the Oasis of the Seas, as well as a bar that rides up and down between three decks. Not only that, but Labadee will soon boast three new features, now under development: the "retail experiences" of Dragon's Plaza and Labadee Town Square, and the Columbus Family Beach. Dragon's Plaza will be the heart of Labadee and will also feature the Dragon´s Breath Café and Pub, a welcome centre, and central tram station, which will ferry guests to other areas of the peninsula. 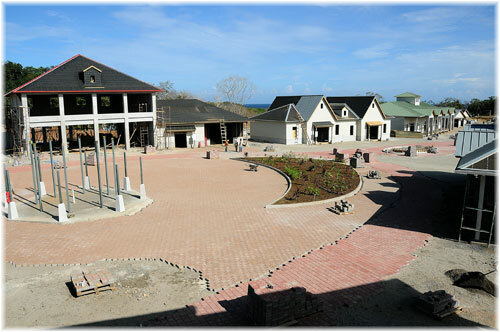 Labadee Town Square will offer guests shopping, dining and entertainment, including the Haitian Cultural Museum, Café Labadee and Bar, and the Straw and Artisan Market. This expansion, including a new pier, is all caused by Oasis of the Seas, of course, which is scheduled to make her first call there on December 3. Bringing 5-6,000 passengers a week, the existing facilities would have been hopelessly inadequate. Meanwhile, Falmouth, a small 18th Century port on Jamaica's north coast, is due to open in December 2010 as a new cruise port for larger vessels. Located between Montego Bay and Ocho Rios, it will cater for Royal Caribbean's new jumbo-sized Oasis of the Seas and will de developed as a heritage renewal project, based on the town's early Jamaican architecture, plus a large shopping mall, developed from existing facilities. Built as a planned town, Falmouth had piped water even before New York. Once home to several hundred sugar plantations, it thrived during the slave trade but has been relatively quiet since 1840 and is only now being redeveloped. One potential source of confusion, however, is that there is already a cruise port called Falmouth in Antigua. In all this modern cruise port development there is something wonderfully reminiscent of America's early theme parks in the days before Disney. A century ago many large US cities had amusement parks developed closer to home so that the population could escape their day-to-day activities, often by dedicated steamers that took millions to locales such as Coney Island from Manhattan, Bob-Lo Island from Detroit and Crystal Beach from Buffalo. Both the latter were actually in Canada (and two of the Bob-Lo steamers are still afloat awaiting refurbishment). Coney Island itself had two kinds of steamers - as well as the ones that took the crowds from crowded piers of Manhattan and elsewhere to Coney Island, the other "Coney Island steamer" was the hot dog that was sold in Coney Island starting in 1871. And Coney Island had not only its fairground rides and hot dogs but beaches and even hotels. 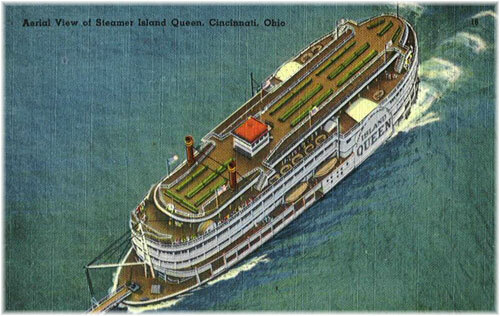 There were even two Coney Islands - as well as the one in Brooklyn, Cincinnati developed its own, along with a five-deck steamer called the Island Queen that could carry up to 4,000 passengers at a time from Cincinnati to their "island" escape, actually on the mainland ten miles up the Ohio River. Much like these destinations, Cozumel, Grand Turk, Roatan and Labadee (although the jury may be out on Falmouth) are beginning to sound just a little bit like the Coney Island, Bob-Lo and Crystal Beach of a hundred years ago. And the ships going to these new "islands" carry 4,000 or 5,000 just like the old excursion steamers used to. Labadee is even beginning to develop its own tram lines just as Coney Island once did (it had five of them). One is somewhat tempted therefore, if one is not looking for an amusement park, to move over to Oceania, Windstar or SeaDream. Oceania's Regatta, for example, offers a typical 12-night Caribbean cruise itinerary from Miami (for them) that includes Virgin Gorda, St Barts, Dominica, St Lucia, Antigua, Tortola and Samana (but finishes with Grand Turk before returning to Miami). Or, further south, Windstar's Wind Surf leaves Barbados on a 7-day itinerary that calls at Bequia, Grenada, Dominica, Antigua and St Lucia, island stops that are all more familiar to the traditional Caribbean cruiser. While these new ports for 100,000-tonners are perhaps not the kind of cruise experience one is used to, it must be said that the cruise lines are developing plenty for their passengers to do, even if it appears that they own most of the shore side cash registers too. And luckily enough, the cruise market is now large enough to be able to cater to both types of cruiser.